Since it has come to power riding an electoral landslide three years ago, the Awami League's popular support is declining very fast. The party policy-makers seriously need to rethink its strategy and correct its mistakes to fare well in the next general elections. The Message Given in Ballots! Seasoned politician of ruling Awami League (AL), Tofail Ahmed says that his party has made a "strategic mistake" by backing Shamim Osman in the Narayanganj City Corporation (NCC) polls. There was no allegation against Selina Hayat Ivy, the immediate past mayor of now defunct Narayanganj municipality, he says, adding, "But the party backed Shamim instead of Ivy, and the people could not accept that." Another veteran AL leader Suranjit Sengupta says politicians have many things to learn from the NCC election in which the people have won by dismantling the thought pattern of the political syndicate. "People will not accept if we fail to select their preferred candidates." Tofail and Suranjit have finally started to speak their minds to some extent and have made some points on the basis of their observations. They have spoken the next day of the battle of ballots in the NCC in which AL Chief Sheikh Hasina's nominated candidate Shamim suffered a humiliating defeat to Selina Hayat Ivy who was denied the party backing. Both the leaders' observations clearly means that Shamim was a wrong candidate to be backed by the party in the battle. What has made Shamim a wrong candidate? Everyone knows the answer. He is alleged to have deep links with the city's crime ring. His past activities earned him the title "godfather". He is so feared by the local people that no one dares to publicly speak against him. But people spoke eloquently on October 30 against the dreaded man. They voiced an emphatic "no" to his dream to become the "city father". The NCC polls results have exposed, believe some political analysts, the failure of the ruling AL top brass to read the pulse of the common people in Narayanganj in terms of the kind of leadership and candidates they expect in the future. Through the October 30 ballots, the people of Narayanganj city have sent a very significant signal to our politicians, particularly to the ruling AL leadership. Policymakers of the ruling AL and the government should think more carefully to decode the signal and to correct their strategic mistakes. If they really think they have made no mistakes in their strategy and they have done nothing wrong, they may keep themselves busy with what they are doing now. They need not review their stance and decide the future course of actions. They can easily keep their eyes closed. They don't need to follow the wind of change in the air. They may argue that it is a mere local government body's election, that the people have elected their local representatives, that local issues have dominated this polls and it will have no impact on national politics. They may also reject their political opponents' views that the humiliating defeat of the ruling party backed candidate in the NCC polls point at the government's declining popularity. The records, however, say something different. Annoyed with the bad governance, the ruling party-men's unruly behaviour and controversial activities against people's interests, voters started to express their dissatisfaction through the ballot whenever they got the chance whether the polls were national or a local government body election. Previous trends show that polls of some local government bodies are very crucial before every parliamentary election, for they forecast the parliamentary elections held later. The first mayoral polls to four city corporations were held in 1994 during the BNP-led government's regime. The then main opposition AL backed candidates won mayoral posts in two major city corporations–Dhaka and Chittagong– defeating the then ruling BNP supported contenders with big margins. At that time, then ruling BNP-blessed candidates won mayoral posts in two city corporations—Rajshahi and Khulna. The then ruling BNP's popularity was declining at that time. And their men were more desperate to ensure victory in a parliamentary by-election in Magura. The BNP rigged the polls in favour of its candidate. The rigging fuelled the street agitation by the then opposition, which demanded the introduction of the caretaker government. In the June 1996 parliamentary polls, the BNP conceded defeat to the AL. In 2005, the Chittagong City Corporation polls became a fierce battle ground for the then ruling BNP and the opposition AL. The then opposition backed candidate ABM Mohiuddin Chowdhury won the mayoral post, defeating ruling party man with a big margin. Around four months before the ninth parliamentary elections, polls to four city corporations and nine municipalities were held in August 2008 under the army-backed caretaker administration. The AL backed candidates captured all the mayor offices in four city corporations--Rajshahi, Khulna, Barisal and Sylhet-- and also mayoral posts in eight of the nine municipalities. Their archrival BNP backed candidates grabbed only one. At the end of the year, the country's people in the ninth parliamentary ballots gave a landslide mandate to AL-led grand alliance, rejecting the BNP-led four party alliance for its misrule in 2001-2005. But the ruling AL seemed to have failed to maintain its skyrocketing popular support that they had bagged in the December 29 parliamentary election. Its popularity started to decline largely due to the ruling party-member's unruly behaviour and criminal activities across the country. The Chittagong City Corporation polls in the middle of the last year have exposed the ruling party's declining popularity even further. AL leader Mohiuddin, who served as mayor since 1994, conceded a humiliating defeat to his own disciple in local politics. Mohiuddin and his fellow Awami Leaguers' controversial and anti-people activities in the port city area contributed to his defeat. In early January this year, the ruling AL suffered a major blow in the municipality polls: it lost the battle of ballots to its archrival BNP. The AL-blessed candidates won 88 mayoral posts, lagging behind the BNP-backed candidates who bagged 92 posts out of the 236 municipalities that went to polls. Fresh from a morale-boosting performance in the municipalities' polls, the main opposition BNP at the end of January has dealt a huge blow to the ruling party by winning the Habiganj-1 constituency, traditionally an AL stronghold. AL's deceased leader Dewan Farid Gazi had been elected from this constituency in 1973, 1996, 2001 and 2008. 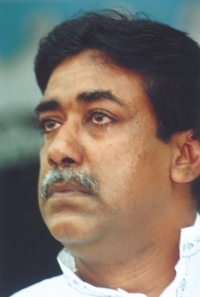 Jatiya Party candidate won the seat in 1991 election. Following Gazi's death the seat fell vacant and went to by-polls on January 27, in which the BNP candidate won, surprising the ruling party. Grassroots level leaders of AL also could not fare well in the union parishads election held in March and June this year. Extortions, manipulation of tenders, violence in educational institutions and unruly behavibour of some members of the ruling AL and its front organisations have tainted largely the image of the current government in the last three years. Failures of some ministers to deliver on people's expectations and controversial activities of many AL's MPs have worsened the situation. The Narayanganj city polls have come as the latest blow to the ruling AL, as, in the election, people have said an emphatic "no" to the party backed candidate. Sheikh Hasina, who emerged as the supreme leader of the AL and whose leadership in both the party and the government is unquestionable, played the pivotal role in lending her party's support to Shamim Osman in the NCC polls. Despite her candidate's humiliating defeat, Hasina, according to media reports on Tuesday, says she is "very happy" with Ivy's victory. "I am highly pleased to see a woman come out winning the mayoral post," a cabinet minister quoted an elated Hasina as saying at a weekly cabinet meeting. What can her reaction otherwise be? Was it possible for her to be annoyed with Ivy's victory as she defeated her blessed candidate Shamim Osman? In fact, Hasina at least demonstrated her "political wisdom" by expressing her "happiness" with Ivy's victory as the reality is different now. One can be sure that 99.99 percent people of the country who were eagerly following the NCC polls are happy with Ivy's win as the woman who personifies humility has already seemed to have become a symbol of good politics. She has become a symbol of people's protest against extortionists, land grabbers, mafias, criminals, and criminalisaiton of politics. So, Hasina's critics may argue that she did not have an alternative, but to openly express her "happiness" now that Ivy has won. The AL chief however has many things to analyse to correct the "strategic mistakes" and read the people's pulse to decide her party and the government's future course of actions. Her well-wishers sincerely want to see her really happy with the victory of her party leaders. They want to see numerous Ivies in her party that once was historically close to the downtrodden section of the society. Like her father Ali Ahmed Chunka, who won the Narayanganj municipality chairman post defeating his party and the then ruling AL backed candidate in 1974, Ivy is close to the downtrodden sections of society. Riding on their support, Dr Ivy, who flew from New Zealand to Narayanganj to win the top position of the then municipality in 2003 by defeating the then ruling BNP-backed candidate. For the last eight years, she administered the municipality with an image of honesty, integrity and transparency. Even her political rivals from the traditionally opposing camp could not bring any allegations of corruption, nepotism and hooliganism against her. And she has proven once again that if someone works for the people and remains honest, people stand behind him/her. The people of Narayanganj city have honoured Ivy; they in fact have honoured the entire country's dream of clean politics and honest candidates in public offices. Now it's Ivy's turn again to serve the people who gave her a relatively clean team to run the corporation, by rejecting candidates with criminal records. The success of the first woman mayor of a city corporation will encourage others to follow suit.